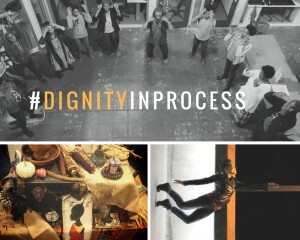 #DignityInProcess is a pilot for Afro-Indigenous Liberatory Practice and an opportunity for the healing tradition of the ring shout to engage a wide audience, while directly collaborating with current justice movements and providing an arts-based cultural equity framework for Bay Area arts administrators. #DignityInProcess is in response to the Black Lives Matter movement, merging art activism, ancestral healing, and intersectional identity evolution within the Afro-Indigenous Diaspora. EAP and ChE, #DignityInProcess Artistic Director, are collaborating to incubate #DignityInProcess within EAP’s programs and organizational structure to center the ring shout as powerful traditional art form to engage social justice movement organizers, art administrators, and the broader arts community of the Bay Area.